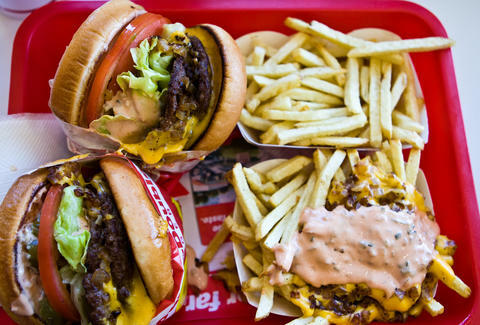 In-N-Out may be the best fast-food chain to work for, but when it comes to the burgers they're grilling up, they can only get as close as second place -- at least according to new data from Consumer Reports. Nor can Five Guys crack the top two (maybe if it had more guys...?). So what is the best-rated burger chain in the country? A little four-state joint called The Habit Burger Grill. The Consumer Reports data, which catalogs the "deliciousness" of each chain's burgers on a scale from one to 10, places The Habit Burger Grill in the top spot at 8.1, narrowly edging out In-N-Out (8), Five Guys (7.9), and Smashburger (7.9). Over 32,000 subscribers were polled on their favorite fast-food "dining experiences," the results of which were damning for McDonald's, relegated to last place with a deliciousness rating of 5.8. Shake Shack was notably omitted from the rankings. The Habit Burger Grill operates almost 100 locations over four states (California, Arizona, Utah, and -- curiously -- New Jersey), and specializes in Charburgers with caramelized onions. Maybe it's time to get in the Habit? You can check out the rest of the ratings here. Adam Lapetina is a Food/Drink staff writer for Thrillist, and wants every restaurant's food to have a "deliciousness" rating. Read his musings at @adamlapetina.